This soup is fairly time consuming, so making this large batch will probably give you leftovers. What you don’t use today can be frozen and reheated for those nights when you don’t have time to cook. Combine ground veal, breadcrumbs, egg, onion, parsley, salt, garlic and pepper, mixing lightly but thoroughly. (Mixture will be moist.) Shape into 36 (more or less) small 1/2 inch meatballs. Arrange in greased 15 x 10 inch jellyroll pan. Bake in 350 degree oven 15 minutes or until centers are no longer pink, turning once. Preheat the oven to 375 degrees F. Place the bones in a roasting pan and bake until they are golden brown — about 1 hour. Remove the pan from the oven and cover the bones with the carrots, celery and onion — bake again for another 1/2 hour. Remove bones and veggies from the roasting pan and place in a large stockpot, add the water (bones should be covered in water) and remaining ingredients. Do not wash the roasting pan yet. Add 2 cups of water to the pan and scrap with a metal spoon to remove the baked on goodies, add this liquid to the stockpot. Bring stockpot to a boil and reduce heat to simmer the stock. Using a ladle, skim the fat and impurities off the surface of the stock (repeat several times). Stock should simmer for at least 6 hours until it has flavor and brown color. Taste and adjust seasonings with salt and pepper. Strain off the stock into another container. This stock, of course, has many other uses. 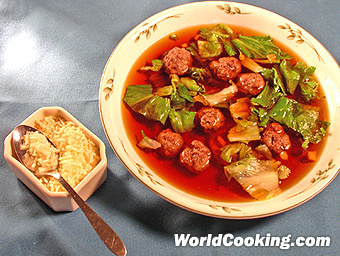 In a large pot bring the stock to a boil and add the meatballs and escarole. Simmer about 20 to 30 minutes. Ladle into bowls and top with Parmesan cheese. Cut an x into the bottom of each tomato. Plunge tomatoes into boiling water for 30 seconds to loosen skins then immerse in ice water. Slip skins off. You will need four bowls for the rest of the process. 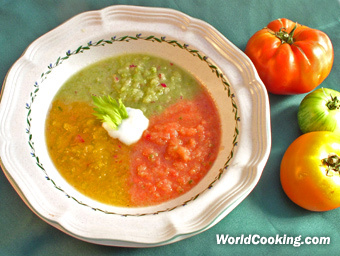 Keeping the colors separate coarsely chop tomatoes then puree in a blender or food processor. Place purees in separate bowls. 1/2 lb. fennel bulb, trimmed and diced small (slice a few thin slices first for garnish and reserve in ice water). 1 c. white wine, chardonnay or sauvignon blanc. 1 c. vegetable broth, canned or your own homemade. 1/4 sweet red bell pepper, seeds and rib removed, diced fine. In a small soup pot, sauté the onion in olive oil slowly taking care not to brown. Add the garlic and continue for another minute. Trim off the excess green of the fennel and dice. Stir in the fennel and sauté for another minute. Add the white wine and vegetable broth. Simmer for 10 minutes. Puree with a stick blender ( the best tool for this job ) in the pot, puree in small batches in free standing blender. Return to the pot and season with lemon juice, salt and pepper. Ladle into bowls and garnish with the reserved fennel and diced sweet red pepper. Serve with warm bread. Bring water and stock to a boil. Lower heat and add cucumbers, dill, sorrel, lemon zest, membrane, and pulp; simmer until tender. Puree. Add juice and season with salt and white pepper. Chill at least 2 hours. Place vegetables in a soup pot with a cover. Add orange juice and water. Simmer slowly covered until the veggies are tender. Puree and adjust the seasoning with a squeeze of lemon, salt and pepper. Add the whipping cream and simmer for 2 or 3 minutes. In a 2 quart soup pot sauce sauté the celery and onion over medium heat until translucent. Do not brown. Add the remaining ingredients except the cream and lemon juice. Cover and simmer stirring occasionally for 20 minutes until all vegetables and fruit are very tender. Return soup to pot and add cream and lemon juice. Ladle into soup bowls and garnish with a tablespoon of sour cream. I fried up some julienned left over parsnip as an additional garnish. This recipe was given to me by my wife’s-aunt’s-maid Juanita, who lives in Cuernavaca, Mexico. However, her version was not quite as thick and hearty. 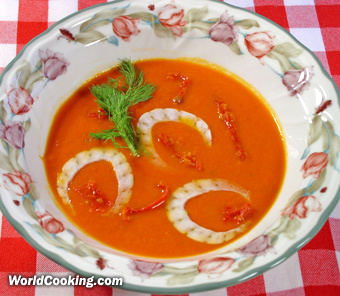 This soup makes a great luncheon entree or dinner first course. Either buy precooked pinto beans or make your own. Usually 1 1/2 to 2 cups of dry beans yield about 4 cups cooked beans. Wash the beans and soak over night. Drain and cover with fresh, lightly salted water. Simmer for about 3 hours. Keep adding water if necessary, taking care not to let the water level go below the beans. Sauté the vegetables in the oil until they are tender. Add them, the herbs and spices to the beans. Simmer for 1/2 hour more. In a separate sauce pan melt the butter and add the flour while stirring. Gradually add the milk as you stir. Cook the cream sauce over low heat until it bubbles. Combine the grated cheese with the sauce and stir until melted. Add the cheese sauce to the bean soup while mixing. Cook over low heat another 1/2 hour. If the soup is to thick add more water. Salt and/or pepper to your own taste. Chop the onion and garlic finely in a food processor. In a 1 gallon soup pot sauté the onion and garlic in olive oil stirring constantly until translucent. Clean the calamari and slice the bodies into rings. 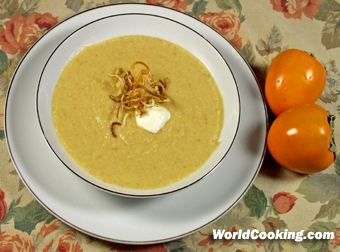 Puree canned tomatoes in a blender or food-processor, add to the sautéed onion – garlic mixture. Add the calamari, white wine, olives and salt. Bring to a slow simmer and cover. Cook at least 18 hours. I found that the best method is to bring everything to a boil and transfer every thing to a crock-pot and cook on low for 18 hours. The long cooking time will make the calamari very tender. Serve with a baguette that has been sliced open and brushed with olive oil and either grilled or broiled.